On April 4, a group of international buyers’ associations from the garment, footwear, sporting and travel goods industries sent a letter to Cambodian Prime Minister Hun Sen to express concerns over abusive labor practices and human rights violations. Already, Cambodia’s tax-free access to the vast European Union market, granted under the EU’s “Everything But Arms” scheme, is in danger of being suspended over such violations. If the country is excluded permanently from EBA and other preferential trading arrangements, the associations warned, their sectors -- and the economy -- will take a serious hit. Hun Sen claims that the international community is unfairly singling out Cambodia. But the truth is that intensifying pressure on the country is consistent with a broader global shift, in which investment is increasingly guided -- even dictated -- by environmental, social, and governance factors. Gone are the days when strong ESG performance was a nice bonus for investors. Pension trustees and fund managers now insist that the companies in which they invest operate in ethical, transparent ways that limit reputational risk. Investment decisions at emerging-market funds are thus increasingly preceded by rigorous ESG screening -- after 34 years of Hun Sen’s dictatorial rule, Cambodia has no chance of passing. Cambodia is currently being stripped of its natural resources -- including timber, rubber and sand -- for private gain. Environmental degradation -- especially deforestation -- is accelerating and corruption is running rampant, with cash from opaque sources flowing into Cambodia’s casinos, banks and real estate market. In February, the intergovernmental Financial Action Task Force put Cambodia on its “gray” watch list, noting that no money laundering case has ever been prosecuted in the country. Cambodia ranked No. 161 out of 180 countries in Transparency International’s 2018 Corruption Perceptions Index. While Cambodia’s resources have enriched some, the country’s workers are afforded little protection, and those fighting for change risk a violent end. In 1997, a grenade attack on a peaceful protest in Phnom Penh, which I was leading, left 16 demonstrators dead. More than 100 others, including the trade union activist and opposition leader Chea Vichea, were injured. In January 2004, Vichea was shot dead in broad daylight. Hun Sen’s political opponents face similar repression. Kem Sokha, the leader of the Cambodia National Rescue Party, of which I am a co-founder, was arrested in September 2017 and spent a year in prison before being transferred to house arrest. He has been detained without trial for longer than the 18-month maximum dictated by Cambodian law. And the CNRP, which won close to half the votes cast in both the 2013 general election and local elections in 2017, was dissolved by court order ahead of the general election in 2018. With only fake opposition parties allowed to participate in that election, the ruling Cambodian People’s Party won every seat in the National Assembly. With that, the Cambodian people have effectively been stripped of their right to self-determination. It does not have to be this way. Cambodia boasts unrivaled tourist attractions, large stores of natural resources that could be profitably and responsibly exploited, and one of the world’s youngest labor forces. In the 1960s, it was one of Asia’s fastest-growing economies. By now, it could -- and should -- have become a middle-income emerging economy on par with neighboring Thailand and Vietnam. Four decades after the Khmer Rouge was ousted from power, their reign of terror can no longer be used as an excuse for this failure. After all, Cambodia is not the only emerging economy with a troubled past. Other countries have recognized and adjusted to shifting Western investment priorities, raising their game in terms of environmental sustainability and human rights. They are now attracting growth-enhancing foreign capital. Cambodia needs to do the same, with or without Sen. Otherwise, it risks being left behind permanently. 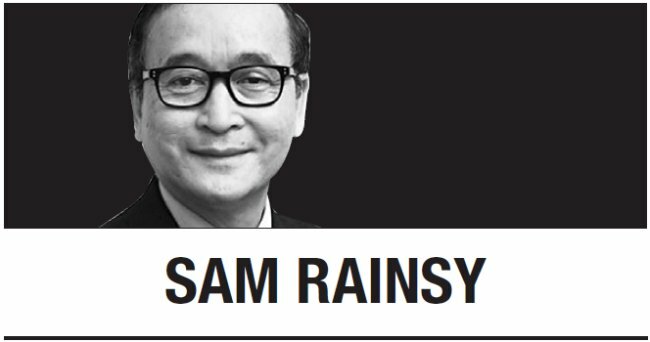 Sam Rainsy, Cambodia’s finance minister from 1993 to 1994, is the co-founder and acting president of the opposition Cambodia National Rescue Party. He lives in exile. -- Ed.